Disaster Public Health and Older People introduces professionals, students, and fieldworkers to the science and art of promoting health and well-being among older people in the context of humanitarian emergencies, with a particular focus on low- and middle-income country settings. Older people face specific vulnerabilities in physical, mental, and social well-being in disasters. They are likely to experience socio-economic marginalisation, isolation, inaccessible information, and lack of relevant post emergency support services during disasters. In contrast, older people can significantly contribute to disaster preparedness, response, and recovery; but their capacities are often under-utilized. Drawing on a range of case studies from around the world, this book provides readers with a strong theoretical underpinning, whilst also empowering them to take the actions necessary at the individual, community, and national levels to reduce the health risk to older people posed by the increasing frequency and intensity of disaster, in particular those resulting from natural hazards. Topics covered range from the health impact of disasters on older people and response to their post-disaster health needs of the elderly, to disaster preparedness, disease prevention, healthy ageing, global policy developments, and the contributions of old people in disaster contexts. This book makes lessons learnt from previous disasters available and comprehensible to students and professionals working in disaster medicine, disaster public health, humanitarian studies, gerontology, and geriatrics. 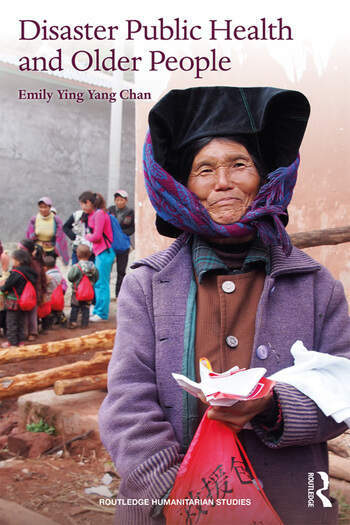 Emily Ying Yang Chan serves as Professor, Head of Division of Global Health and Humanitarian Medicine, Professor (by Courtesy), Accident and Emergency Unit, and Assistant Dean of Faculty of Medicine at The Chinese University of Hong Kong. She concurrently holds academic appointments as Visiting Professor (Public Health Medicine) of Nuffield Department of Medicine, University of Oxford and Fellow of FXB Center, Harvard University, and is Co-Chair of WHO Thematic Platform for Health Emergency and Disaster Risk Management Research Network. She is author/editor of numerous book titles and articles, including Public health humanitarian responses to natural disasters (Routledge, 2017).